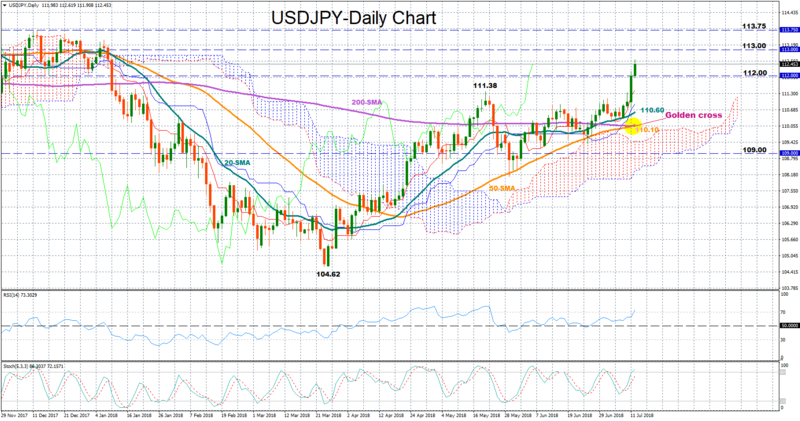 USDJPY managed to resume its bullish pattern started at the end of March from 104.62, hitting a fresh six-month high of 112.61 on Thursday. The market will likely hold the uptrend line intact as long as the price continues to move above its moving averages and should the 50-day (simple) moving average (MA) successfully complete its bullish crossover with the 200-day MA, the upward movement could stretch into the longer term. Yet, the RSI supports that the rally is overdone as the index has already entered the overbought zone (above 70) and the stochastics are also showing signs of overextended prices. If this is the case, the price could change direction to the downside to meet support at 112, which could be of psychological significance. Below that level, the positive phase could switch to a neutral one if the pair falls below May’s peak of 111.38, while the area outlined by the 20- and the 50-day MA should attract some attention as the region has been repeatedly violated from May onwards. Then if negative momentum strengthens even further pushing the market below the 50-day MA, which curbed downside movements at the end of May and June, bears could run the pair down to the 109 handle. In the positive scenario, the price could extend gains above today’s high of 112.61 to meet resistance between 113.00 and 113.75, where the price topped several times from September to January. If the area fails to hold then the next target could be 114.72, the highest mark recorded since March 2017.